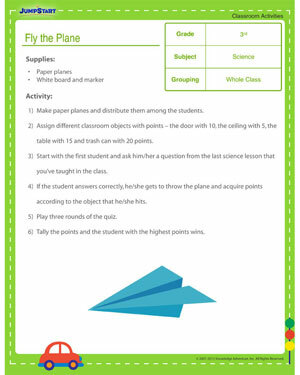 ‘Fly the Plane’ is a cool and fun classroom activity that needs to be played with the whole class. Teachers can make the paper planes in advance so that they can start with the classroom activity as soon as the bell rings! The questions can be altered to suit another subject like mental math, English or social studies. Browse more classroom activities on JumpStart.